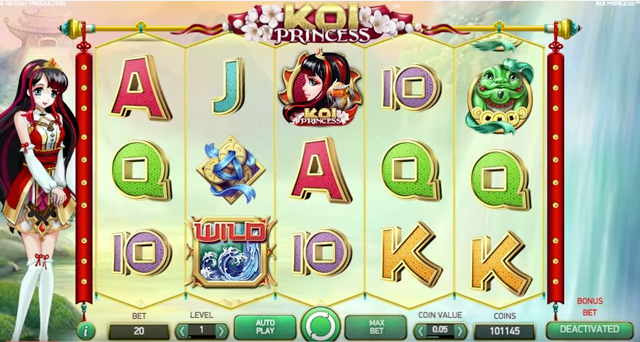 If you want to play slot online now then work your way through this beautifully illustrated manga 5 reel slot alongside the Koi Princess, the Japanese damsel who will guide you through your free spins and bonus bets. Transport yourself to a quaint Japanese pagoda and win yourself a jackpot of up to £100,000. 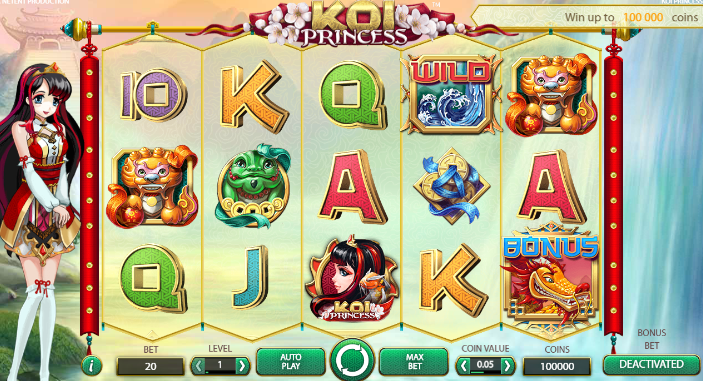 Koi Princess is developed by NetEnt, a leading provider of premium online casino games. You will find their games hosted by some of the world’s most successful online casinos such as Easy Slots and DreamJackpot.com. They have pioneered a cutting-edge platform for creating well designed visually thrilling games, with rich graphics and a clean interface that retains its appeal to frequent players of WizardSlots. This is one of the highly distinctive slots with a refined visual appeal that conjures dreams of an idyllic life in a Japanese Garden. The beautiful Koi Princess stands sheepishly beneath an ornamental temple and will do a candid, little jig every time you win. The heading is bedecked with Lotus flowers, a sacred symbol that points the way towards the true enlightenment of the Koi Princess. To determine the quality of this game, check out this list of best slots games to play. The game has a cute but tasteful Japanese theme, including iconic Asian graphics. It has a peaceful and serene design that bodes well for the standard 5-reel, 3-row set-up that has become commonplace in the online slot gaming market of late. Players will feel very much at ease in this setting. But don’t worry about falling asleep. There are reel symbols filled with Carp, Dragons, Golden Coins and the lovely Koi Princess herself to keep your attention. And look out for the big waves of a Wild Tsunami. Wild symbols substitute for all other non-bonus symbols and pay the highest possible winning combination. This game has a good mix of random, bonus and wild features to push for those thrilling wins. It is played with 20 bet lines and bet levels of 1-10 with different coin values. A Bonus Bet option can be activated for each spin, which increases the chances of achieving a Random or Bonus Feature. The random features are 5-Hit, Random Wilds, Wild Reels and Bonus Game activation that can be activated and taken advantage of when you embark on every spin. 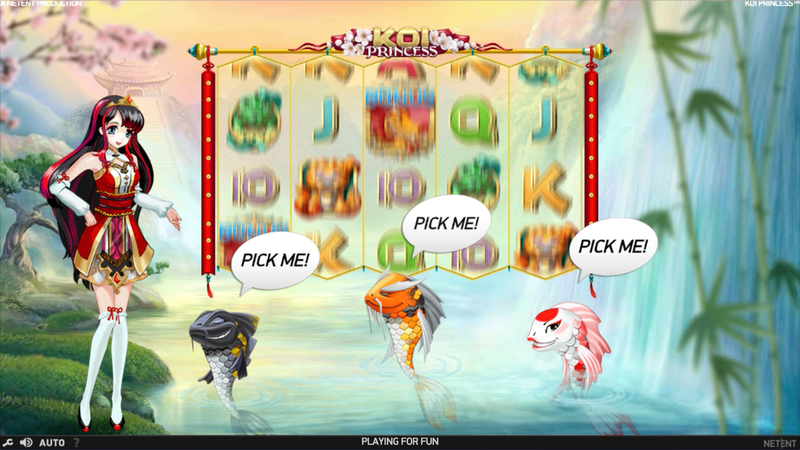 Every spin is a journey when you play alongside the Koi Princess. You can win up to 100,000 coins. When playing at the highest bet level there is a max bet button to play the game at the maximum bet lines and this is something that will automatically carry across into future spins throughout this round of the slot. A tasteful and pleasant game. We enjoyed the subtle design and clean interface. There is nothing tired about this video slot set in a Japanese Garden. It may have restorative powers since we felt somewhat refreshed after playing it and getting those wild wins. Its beautiful graphics coupled with some amazing bonus features make this game a stand-out 5 reel for the team at Wizard Slots. When you're finished here please also try our cherry trio slot.